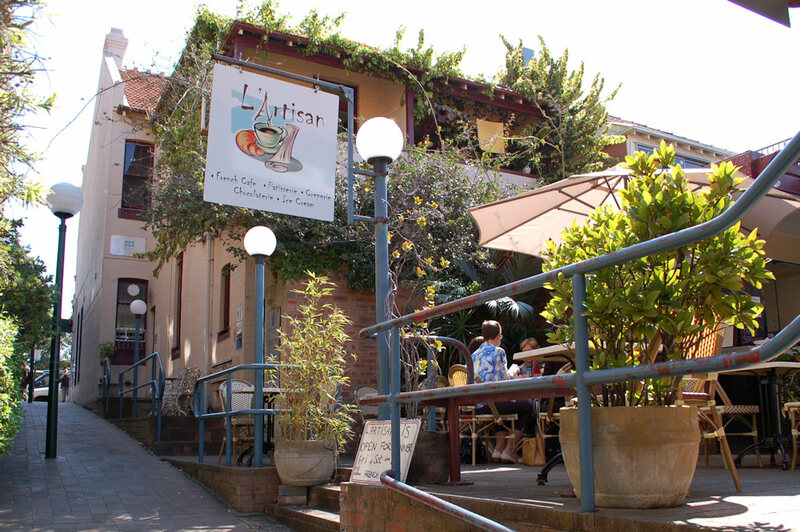 Hidden away from busy Military Road in Mosman is a small French café and restaurant named L’Artisan. The location was previously home to the similarly themed Le Gamin De Paris for almost 25 years. There are a number of tables inside but there’s no reason to sit inside with such an inviting courtyard. We were seated promptly and began to scan the menu while being distracted by watching the chef making crêpes in his outdoor kitchen. The menu is small, consisting mainly of crêpes, cakes and specials but they seemed to take a lot of pride in the food and establishment so we were excited to taste what was on offer. We chose the Pearisienne ($6.50) mainly because of it’s name. 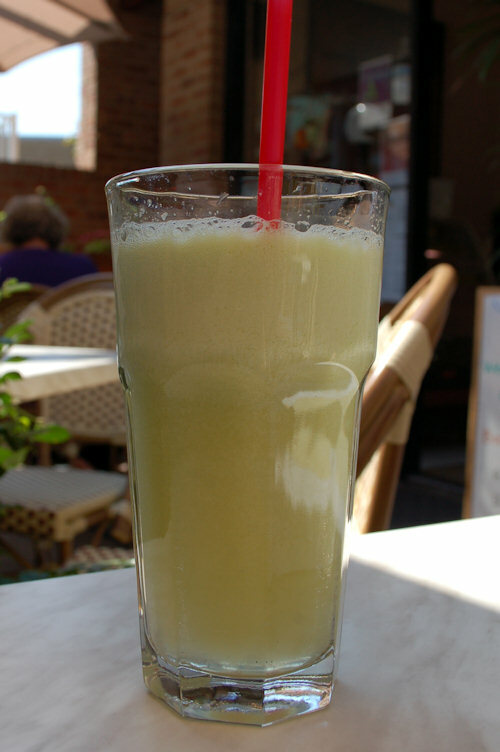 It was a blend of apple and pear juice which was refreshing and delicious. 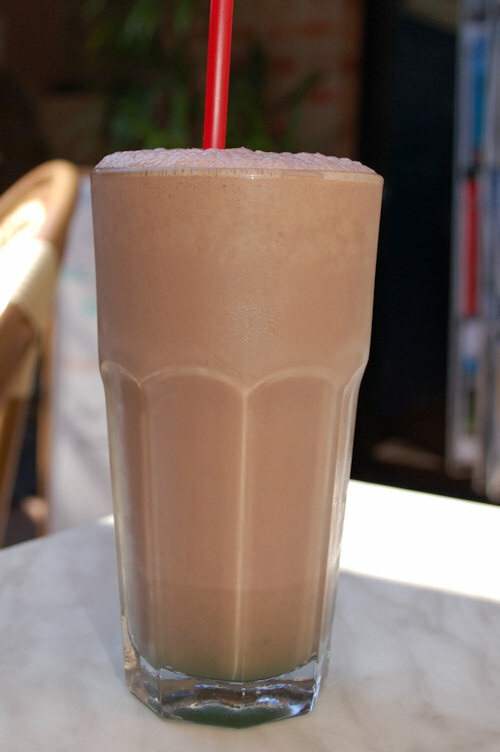 The choc mint shake ($6) was out of this world and we dare say it rivals the milkshakes at Ruby’s Diner. It was thick, minty and satisfied our need for chocolate overload. 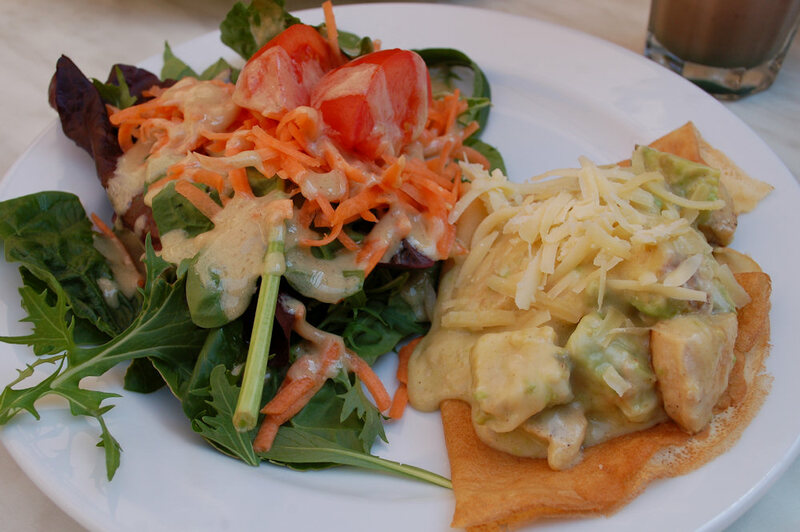 The L’Australie ($16.50) consists of chicken, avocado and cheese in a white wine sauce. The cheese and sauce bind well together to make this a rich and tasty meal. The dressing on the accompanying salad was tangy mustard and vinaigrette based. The meal overall was sufficient in size however big eaters will be left craving more, especially in regards to the crêpe itself which was smaller than the salad. 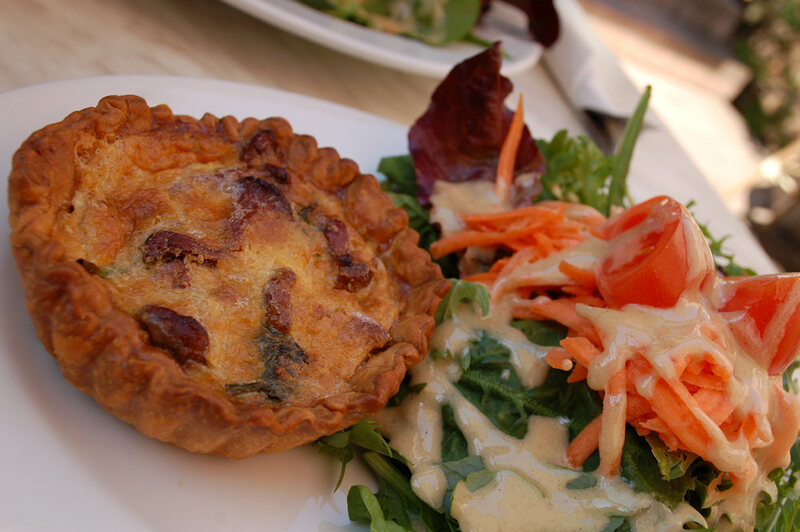 We tried the Tarte du Jour which was wild mushroom and spinach quiche ($16.50). It was clearly over priced and rather disappointing. It was dry and salty, perhaps left in the oven for too long. The flavours didn’t seem freshly made which we would’ve expected. The salad had too much dressing for April’s taste and didn’t combine well with the quiche. Next to us was a group of women practising their French and catching up on the latest gossip. We can recommend meeting up at L’Artisan for a relaxed and unpretentious lunch. We are interested to try the dinner menu (available on their website) and special occasion dinner parties that feature food from a different region of France each time. If anyone has been to one of these events, please comment below and let us know what you thought. This entry was posted in Sydney - North Shore and tagged Fresh fruit and vegetable stores close by, Outdoor seating, Parking close by. Bookmark the permalink. You should try the sweet crepes here.